Recently I was waiting at O’Hare for a flight back to Columbus. I fired up Evernote to catch up on some Windows Azure articles I wanted to read (I save a lot of things to Evernote). One of the first articles I read was a CodeProject article by Luke Jefferson at Red Gate. 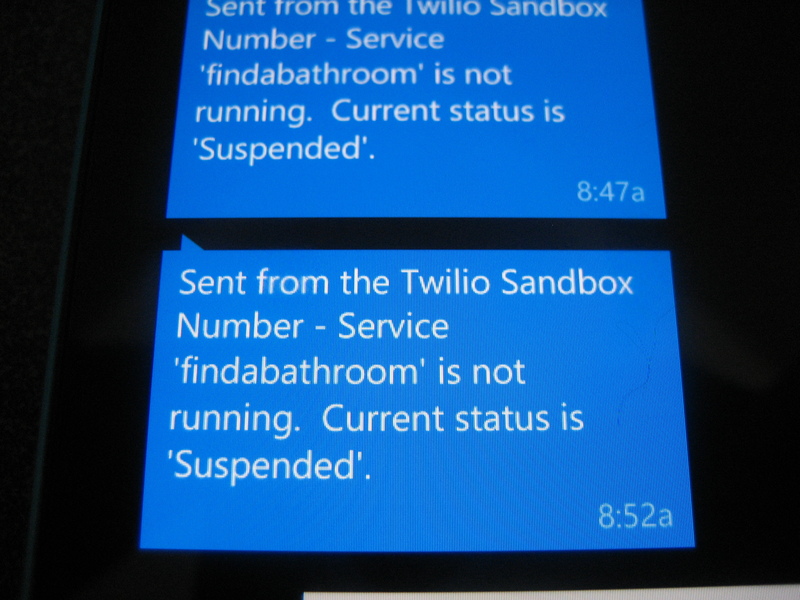 Luke’s article provides a really nice basis for using Cerebrata’s PowerShell Cmdlets and Twilio for sending SMS messages when your Windows Azure service has “issues”. This got me thinking – could I write something similar (I was inspired) before I returned home to Columbus? 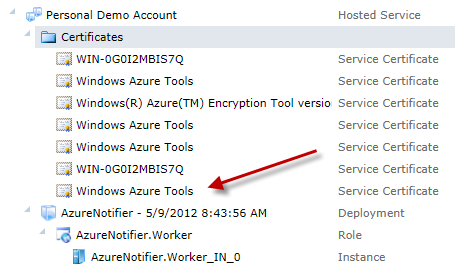 I’d like to tweak it a little to run as a Windows Azure worker role. I would have to do most of the writing without the crutch of the Internet (remember – no WiFi at O’Hare and no WiFi on my plane). I would have a brief internet connection before getting on the plane if I used my awesome Nokia Lumia 900 for tethering. This is doable! The timing couldn’t have been better! I remembered seeing a Twitter message earlier in the day from @WindowsAzure announcing a new promotion from Twilio to get some free messages for Windows Azure customers. Perfect time to try this out! By the way, if you don’t have Windows Azure yet, now is a good time to get it. Have MSDN? You already have Windows Azure benefits!! Activate now!! While Luke’s article on CodeProject uses PowerShell cmdlets, I wanted to try it with regular C# code and run the solution in a simple Windows Azure worker role. To do so I would need to work with the Windows Azure Service Management API. As Luke points out in his article, the Windows Azure Service Management API is a REST API. He does a great job of explaining the basics, so be sure to check it out and head over to MSDN for all the details. Time to fire up the phone tethering feature, sign up for Twilio, and download their API. I decided to use the twilio-csharp client library and installed that via NuGet. Easy enough. With everything that I needed downloaded, it was time to power down and get on the plane. If the service is not Running, send a SMS message to me to let me know that something is not right. Sleep for a little bit and then repeat the process. // If the service is not running. // Get the configuration settings needed to work with the hosted service. // Get the configuration settings for Twilio. // Create an instance of the Twilio client. I had most of this put together before the stewardess informed me it was time to power down in preparation for landing. The only things I needed yet was a Windows Azure subscription ID, a Windows Azure management certificate thumbprint, and a hosted service to test this against. I have several Windows Azure hosted services running for various reasons, so all this was easy enough to get. With all the necessary bits in place, it’s time to test this out. In order to get this working in Windows Azure (as opposed to my local emulator) I would need to include my management certificate as part of the role I’m deploying. When using the emulator, the certificate is already on my development machine so I didn’t need to do anything special. I would also upload this certificate as a service certificate. With the certificates in place, I was ready to deploy the service as an Extra Small worker role. I then picked one of my demo apps and told Windows Azure to shut it down. Shortly after that, I received a new text message from my Twilio account! While this was just a simple proof-of-concept, it was pretty cool and can be pretty powerful. If you’d like the whole source code for this project, you can download it here.